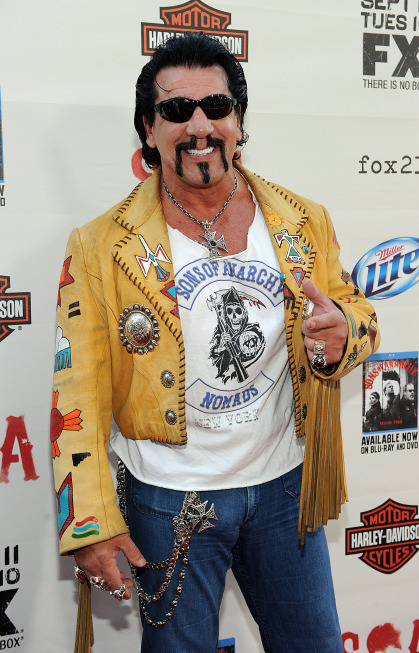 After suing FX for stealing the idea of an outlaw motorcycle club tv show, Chuck Zito joined Sons of Anarchy this year as a transfer from another chapter of the MC (mustache club). Besides acting Chuck is an/was an amateur boxer, martial artist, celebrity bodyguard, stuntman, former boxing trainer and former president of the New York chapter of the Hells Angels. I had to check that list twice to confirm that “High School Gym Weekend Wrestler” wasn’t on that list, seeing as he looks just like one of those nuts. This entry was posted in Sons of Anarchy Steesh, TV Steesh and tagged chuck zito, comedy, entertainment, Humor, Moustache, mustache, outlaw motorcycle club, sons of anarchy, TV on October 11, 2012 by Los Bulls. I would just like to suggest that Chuck Zito get new pants. Preferably men’s, because those girly looking jeans are not even beginning to contain his package. Then again, that might be the goal.